The oldest part is the tower of c1200. Nave and chancel are C13, starting with the north aisle. There was extensive work in the C15 and c1530. There is no sign of any work earlier than c1200 – a ‘circular’ (WSRO Par 21/4/7) [i e round-headed] chancel arch replaced in 1866 was, on the analogy of the former south arcade (see below), probably post-Reformation. The west walls of both aisles incorporate the east buttresses of the tower, which can be dated to c1200, so the nave at that time was aisleless. That apart, it probably had the same dimensions as today, for it is unlikely that it was lengthened when the tower was added. Though altered, this still has a clasping south-west buttress and one south lancet in the upper stage. This surrounds a smaller opening with a shouldered head, which Quartermain (W) shows in 1862 so it is old, though its precise date in uncertain. The simple chamfered outer order of the tower arch is of the same period, though altered. The north aisle was added shortly after the tower, for the arcade has plain and relatively crude piers and steeply pointed double-chamfered arches. The south aisle is more problematic, as the arcade was renewed in 1866, with three instead of four bays (B 24 p821), and the external detail is later. The previous arches were round-headed (ibid), but the re-used octagonal piers look late C13 and as it is unlikely there was an aisle before then, the round heads were probably post-Reformation. The arch from the south chapel into the aisle has a head with wave-mouldings, also a late C13 feature. The south chapel, though refaced, is C13, with lancets and a chamfered doorway. So, probably was the chancel, though only the main trusses of the seven-canted roof can still be of this date. The north chapel is C19 but part of the respond of the arch to the chancel looks old, though Adelaide Tracy (1849) (II, 89) shows no sign of a predecessor. 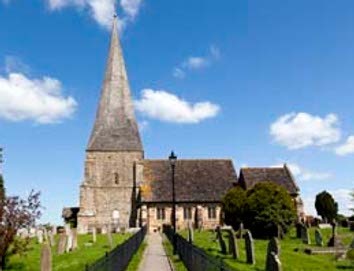 By soon after 1300 the church had attained its present outline, but the square-headed south aisle windows and the crownpost roof of the south chapel are C15. The remarkable panelled nave roof, with heraldic and 117 foliage bosses (1 p254), is presumably the ‘selyng’ [ceiling] that was the subject of four bequests between 1530 and 1532 (SRS 41 p139). This evidence of a sustained campaign of building makes the suggestion (1 p255) that the bosses were not made for the church unlikely. 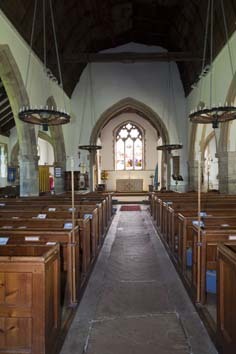 The uncusped square-headed north aisle windows and both aisle roofs, with castellated wallplates and moulded main timbers, are of similar date. 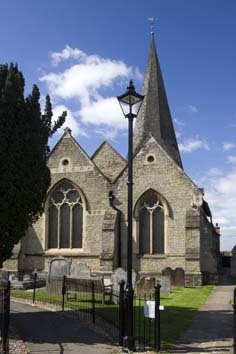 The broach spire, incorporating bell-louvres, is as tall as the tower. Like the west doorway and four-centred west and north openings, it is probably C16. The tower was unchanged in height and a north-west buttress, not bonded in and clearly added, possibly at this time, hints at structural problems. These could also explain the strengthening of the tower arch inside, with an inner order on small shafts. An area of renewed masonry on the east side may also be connected. In the post-Reformation period, dormers were added to both aisle roofs, as shown by Quartermain and Adelaide Tracy and probably intended for galleries; the latter also depicts a segment-headed east window that looks C18. None of these survives, but a fine west porch of around 1600 has open turned balusters in the sides and brick in-filling. The restoration of 1866 under R W Edis (B 24 ibid) obscures the sequence of the earlier building. In addition to the work already noticed, he replaced the east window and renewed most others, though apparently accurately. His chancel arch and that from the south chapel into the chancel follow the work of c1300. He retained the roof-bosses and other timbers when reconstructing the nave roof (WSRO Par ibid). 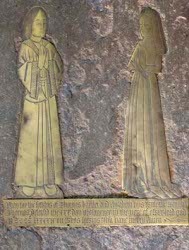 Brass: (Nave) Thomas Bartlet (d 1499) and his wife. Small and crudely engraved. The indents of shields and a crucifix are visible above the figures. Font: Circular with carved roundels, dating from 1866 (ibid). 1. 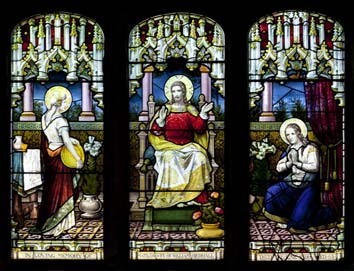 (East and south east chancel windows) The glass of 1866 by Ward and Hughes (B 24 ibid) shows the dark intense colours favoured by the firm at this date. 2. (North chapel, east window) Ward and Hughes, 1866 (ibid). 3. (South aisle, west window) Ward and Hughes, c1881 (www.stainedglassrecords.org retrieved on 4/2/2013). 4. 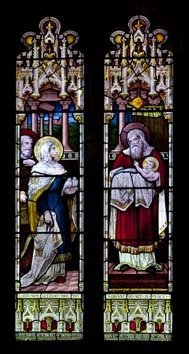 (North aisle, second window) Ward and Hughes, c1886 (ibid). 5. 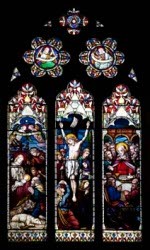 (South aisle, first window) Morris and Co, 1932 (ibid). 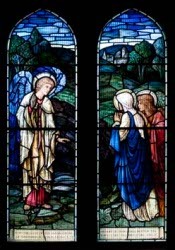 This is not listed in Sewter, but though there may be discrepancies in style from what Morris and Co usually produced, the general appearance is close to the firm’s known work at this late date, which tends to the derivative after the firm’s days of glory, long after the death of Burne-Jones when it had lost most of its major designers and less skilled craftsmen often altered existing designs or took elements from earlier ones. The attribution to Morris and Co is thus in little doubt. 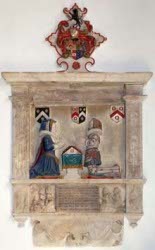 Monuments: (Chancel) Sir Edward Goringe (d1617) and his wife. A small wall-monument with repainted kneeling figures facing each other across a prayer-desk, with their five children. Piscina: (Chancel) Plain and round-headed opening only, of indeterminate date. My thanks to Nick Wiseman for the photographs and some suggestions about the glass by Morris.